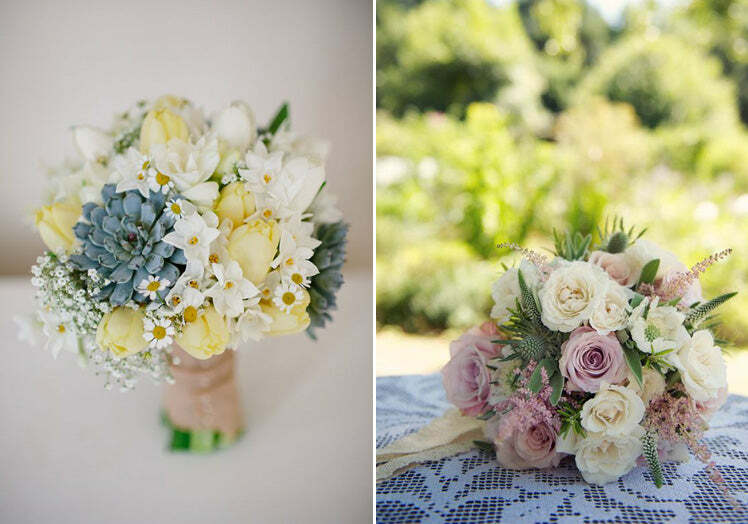 Popular with brides in years gone by, cascade or waterfall bouquets are back in a big way and it’s easy to see why. They’re typically bridal, absolutely beautiful and the modern, looser style suits so many styles of wedding. You can stay on-trend by using lots of greenery and a few statement blooms will give this bouquet real impact. Cascade bouquets look great matched to wedding dresses with A-line skirts. 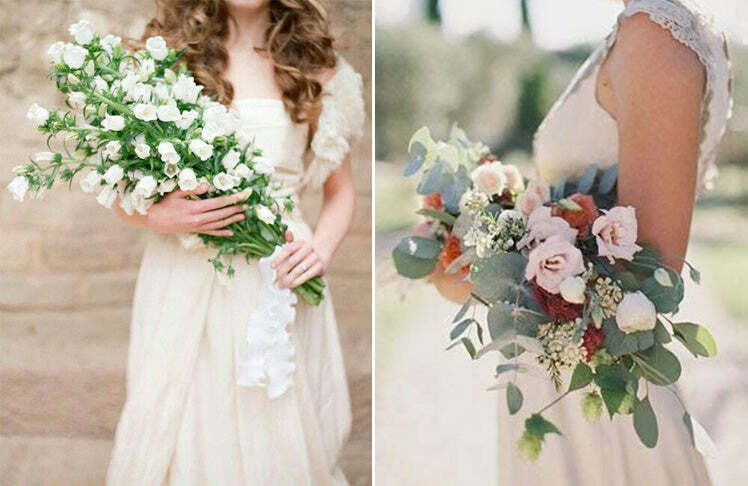 Yes, these oversized bouquets are probably the ones that you’ve been pinning like crazy. 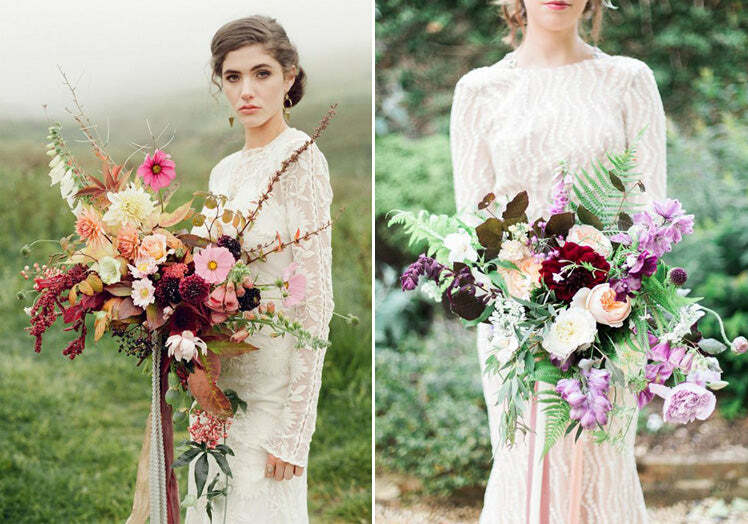 They’re indescribably beautiful, elegant and somehow manage to be both vintage inspired and current at the same time! 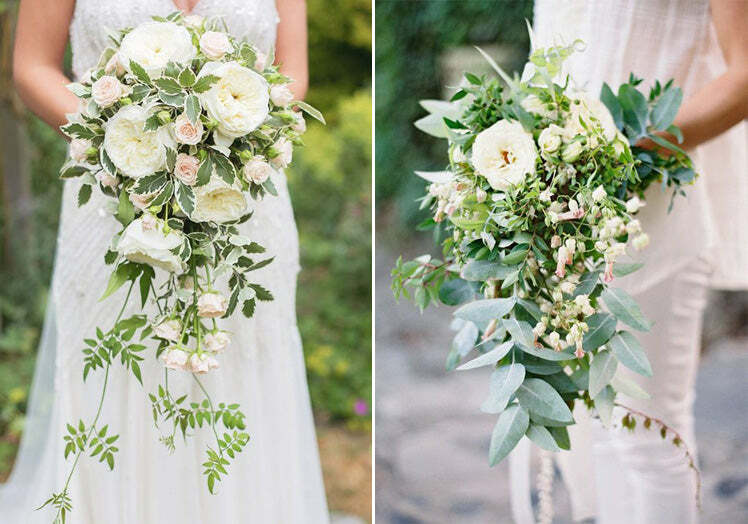 Oversized bouquets look great with big blooms, interesting fillers, oodles of greenery and elegant trailing ribbons. These bouquets look all the more impressive when teamed with straight gowns and the wedding world can’t get enough of this look. 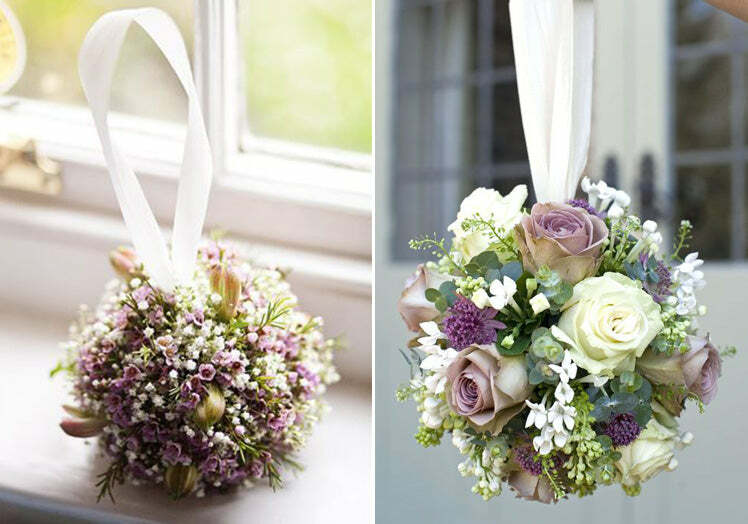 Perfect for a rustic wedding or a bride who adores the natural look, hand tied bouquets are literally just that, bouquets that are tied by hand! 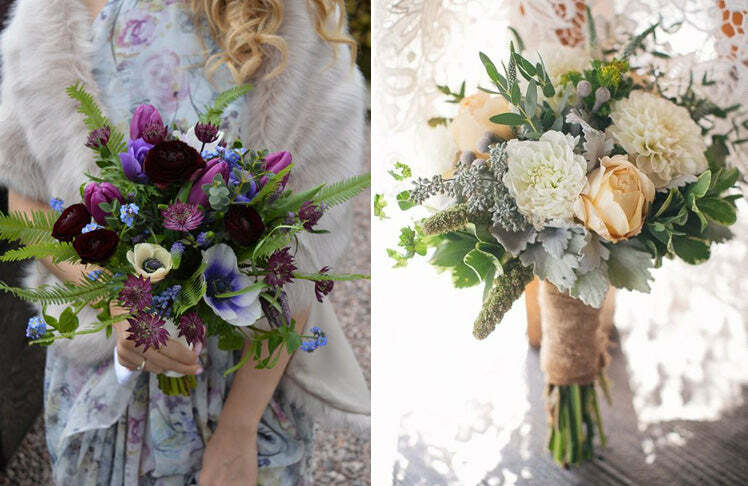 Over recent years, hand tied bouquets have become a bit wilder and a bit more unstructured, probably in response to the popularity of rustic/boho wedding themes. Hand tied bouquets look best with seasonal flowers and foliage and are versatile enough to work with most gown shapes and styles – just show your florist a pic of the dress you’ll be wearing to help them plan the perfect bouquet. Pageant or over-arm bouquets fell out of fashion a little while ago but are definitely on the way back. These are usually oblong in shape and their cascading, over-arm style is being given a really modern and dramatic twist in the designs that I’ve seen of late. Pageant bouquets look downright amazing with fishtail gowns or elegant column wedding dresses. Again, speak to your florist to make sure that the proportions of the bouquet are spot on. Usually seen carried by small flowergirls, pomander bouquets are also making a comeback, particularly with brides looking for an historic feel or with those that want a small floral accessory rather than a large bouquet. Pomanders usually come with a ribbon or jeweled loop so they’re perfect for slipping over your wrist during your drinks reception or if you just want to hold hands with your partner! Typically ‘wedding’, sweet posies are always popular. 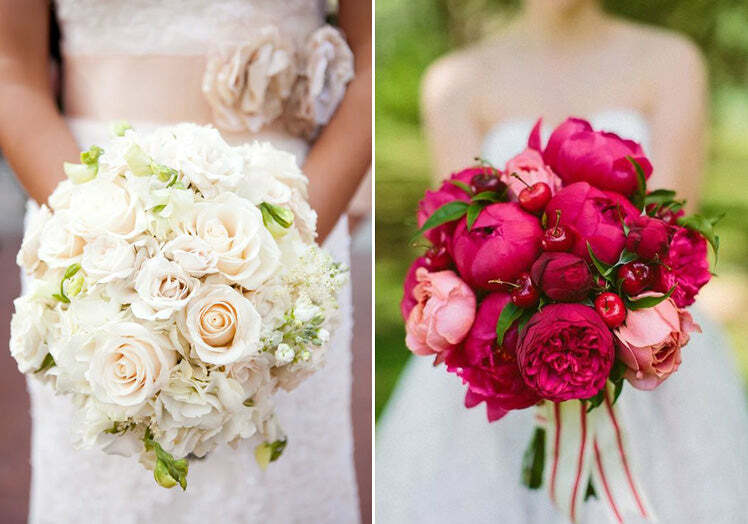 You can choose the size, style and shape to give you a bouquet that you’ll never want to put down. They’re usually a little smaller so are easy to carry and, if you’re worried about your flowers swamping your gown, a posy is the perfect answer. They look best with an empire line or boho style gown but as you can make them more formal or more casual, depending on the design you go for, they work with many styles. Sticking with one flower variety will make the bouquet more formal whilst wild or cottage garden flowers give a more informal, vintage feel. The round design is definitely the iconic bridal bouquet. This style usually includes lots of flower heads arranged tightly in a bouquet. There’s usually not much greenery so expect a good sized round bouquet to be quite costly given the amount of flowers that it includes. A round bouquet will look great against an A-line gown but does suit most gowns but, as always, you’ll need to work with your florist to get the size of the finished bouquet just right. You can include almost any flower in a round bouquet and as there are endless varieties and combinations, it’s a super versatile design that’s perennially popular.